Coming Soon This Spring 2018! DuEast Boutique East Residence, the second of DuEast Residence towers, comes with the all the great area amenities that Regent Park has to offer. Also its unique family-friendly building amenities will sure to please its residents. 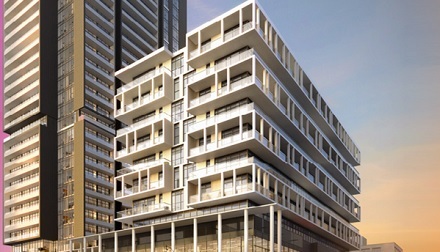 Located at Dundas Street East and Tubman Avenue, DuEast Boutique East Residence offers ultimate in convenience with transit at door step and bike lanes, groceries and restaurants nearby. will characterize the lobby, from which a 24-hour concierge will provide security and convenience. their cardio, or engage in strength training and crossfit. There will also be a recreation coordinator, offering a variety of fitness classes and programming for children and adults. Register today or call 647-834-9928 for your platinum access to prices, floor plans, incentives and important updates.